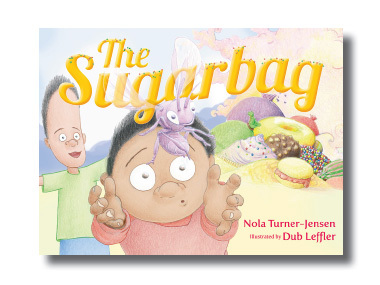 Written by Nola Turner-Jensen and Illustrated by Dub Leffler, The Sugarbag is an adventure story of Jimmy and Max, two young brothers, who are on their way to visit their grandfather. Walking through the bush, they encounter an Australian native stingless bee buzzing around their heads. This gives Jimmy the opportunity to teach little Max all he has learned from his grandfather about hunting for ‘sugarbag’. Sugarbag is the European word for the honey produced by the stingless bee. The boys go racing through the bush in pursuit of the bee hoping it will lead them to its hive. This is Max’s first encounter with hunting for sugarbag and he doesn’t really understand what they are searching for, preferring to imagine some sort of bush treasure trove filled with sweets. ‘Sugarbag is a favourite treat for Aboriginal people. We call it ngarruu. When Grandfather was a little boy, he went hunting for ngarruu with his father,’ Jimmy explained proudly. Max imagined bags of sweets piled up high. ‘Mmmm, sugarbag sounds yummy,’ he rubbing his belly. The author, Nola Turner-Jensen is a a Wiradjuri woman from the river country in Central West NSW. She lives in South East Queensland and for many years worked with Aboriginal and Strait Islander youth. In 2004, Nola established her own company that produced educational resources and toys. Following its success, she has since developed an interactive Aboriginal and Torres Strait Islander Education website for primary schools. She is also a content writer for the Indigenous Literacy Project. The illustrator, Dub (David) Leffler is one of thirteen children. He grew up in the small town of Quirindi, in New South Wales and is descended from the Bigambul and Mandandanji people of South West Queensland. 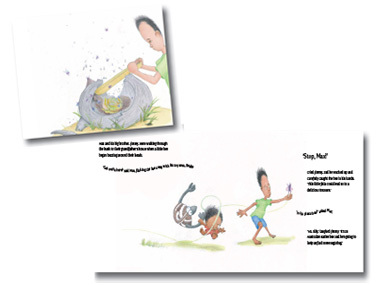 Dub has illustrated several children’s books and has collaborated with internationally recognised illustrators. Once there was a boy, the first book that Dub has written and illustrated, was published by Magabala Books in 2011. The Sugarbag will be available from September 2012 in all good bookshops and online from Magabala Books (www.magabala.com) for $14.95.